It is not just homeowners who can benefit from free solar, if you occupy or own a business or commercial premises or a landowner then you can also get free solar panels installed. There are not as many companies providing this type of service to business as there are for residential homes due to the fact it is more financially attractive for companies to provide smaller sized systems to homes rather than larger installations for the commercial sector. At the moment there is only one company providing free solar panels to businesses and that is Sundog Power. There used to be other but they have since switched to just residential systems, possibly due to the announcement from the government about reducing the tariffs paid for larger scale installations. Whilst Sundog Power manage the project it is their partner company Sundog Energy that will do the actual installation. Businesses are the ideal types of property to benefit from solar. A business tends to be located in a commercial area where there is a large unused roof space that is not overlooked by residential properties. Commercial and business buildings tend to be occupied during the day in daylight hours when the panels will be producing the electricity. This means that the electricity will be used on site which provides maximum benefit for the occupiers. A large solar installation on a business property is likely to provide a large percentage, or possibly all of the electricity requirements of that business. If your electricity bills are quite high then you stand to make a big saving on your bills for at least a further 25 years. A large system possibly costing in the hundreds of thousands of pounds will be installed on the roof of your premises. These panels will remain there for at least 25 years producing electricity for the premises during daylight hours. This means that you will benefit from reduced electricity bills or even no bills at all if you only occupy the building during the day and the installed system can provide all your energy requirements. You may also be able to get a rental income from Sundog for leasing out your roof for 25 years. 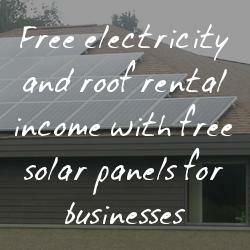 Sundog is able to offer free solar to tenants, landlords, owner occupiers and landowners. The reason that free solar panels are being offered for use on commercial and business properties is that the company that installs the panels can earn back the cost of their investment through the governments feed-in tariff scheme. This scheme pays producers of green renewable energy for up to 25 years. Under the scheme the company can earn back the cost of the installation and make a profit at the same time. You have to apply directly through Sundog's website to find out if your property is suitable. Once suitability is determined a contract to lease the properties roof will be agreed on and they will design and install the system. Once the free panels are installed they will monitor and maintain the system for the 25 year period. There is no cost to the business who is applying to benefit from this scheme and if your property is suitable you will benefit from free electricity and possibly a rental income for sub letting the roof. Update 5/8/2011 A new company, NSA Electrical and Solar Ltd is also providing free solar panels for business premises. At the time of writing I have not spoken to the company to find out the details of their offer but more information is available on their site, freecommercialpvsolarelectric.co.uk. Whilst free solar offers a not cost way to reduce your business electricity costs the real benefits are gained if you invest in solar photovoltaics yourself. With the feed-in tariffs, previously known as solar panels grants, you get tax free payments for all of the electricity that your photovoltaic system produces. These payments will easily cover the cost of your initial investment. It appears that Sundog Power are no longer trading as of October 2011. According to DECC figures a 2.5kWh solar PV system can provide half of homes yearly electricity requirements.